Interior and office signs relay important messages while giving your facility a clean and modern look. Emedco provides the most comprehensive selection of indoor office signs available for your workplace or building. 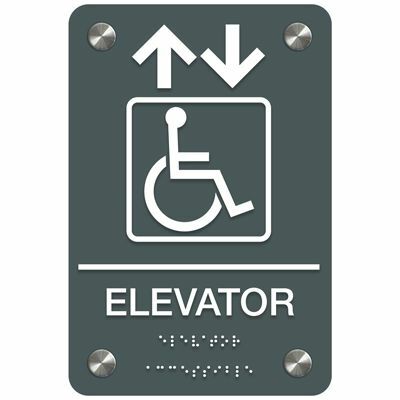 Whether you are looking for ADA Braille, engraved signs and nameplates, acrylic interior decor or safety signs, you will be sure to find a wide variety of styles, materials, and colors ensuring your message is clear. Interior and Office Signs encompass a very large selection of signs for just about any situation or application. Workplace signs can be placed around your office or facility in places such as lobbies, restrooms, warehouse areas, hallways, lunchrooms, smoking areas or just about anywhere! Choose from a large selection of Interior and Office Signs including ADA signs, accessible signs, Braille signs, housekeeping signs, motivational signs, nameplates, engraved signs, restroom signs, recycling signs, emergency signs, no smoking signs, healthcare wayfinding signs and more. Don't have exactly what you're looking for? Create your own custom signs using our online Design Your Own application.